Decade by decade, the lavishly illustrated Vintage Shoes recounts over 100 years of shoe history, from Andre Perugia's designs for society women in the 1920s to the red-soled shoes from Christian Louboutin favoured by celebrities today. Accompanied by archive images, stunning fashion photography and specially commissioned photographs of rare period footwear, the most collectible and fabulous footwear designs are showcased. An invaluable reference as well as a visual delight of times past, the book explores the key designers, technical developments and cultural influences that shaped shoe fashions, revealing exquisite and groundbreaking work from such luminaries as Salvatore Ferragamo, Charles Jourdan, Roger Vivier, Beth Levine, Vivienne Westwood and Manolo Blahnik. 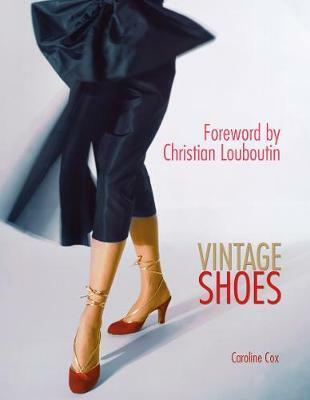 Foreword by Christian Louboutin; Introduction; 1900-1919: Edwardian Elegance; 1920s: The Modernist Shoe; 1930-49: The Hollywood Heel; 1950s: New Look Shoes; 1960s: A Youth Revolution; 1970s: Biba and Beyond; 1980s: Dress for Success; 1990s to Now: Future Collectibles; Shopping and Collecting; Glossary of Designers; Index; Further Reading; Acknowledgements. Caroline Cox, professor of cultural history at the University of the Arts London, is a leading fashion authority whose work explores the relationship between fashion, beauty and culture. Caroline's many books on fashion history and theory have been published internationally and include Vintage Jewellery and Hair and Fashion (2005), which had an accompanying catwalk show at the Victoria and Albert Museum, London.